Initially, I wasn’t going to review this because I do not have a lot experience (read: any that I’m consciously aware of) with Asia’s super-rich. I can’t speak to whether this novel is an accurate portrayal of their lifestyles and inter-family squabbles. But I decided to review it because I can affirm that it is one fun read. Rachel heads to Singapore with her boyfriend Nick for his best friend’s wedding. Never having met his family or even knowing much about them, she is shocked to learn he is a member of one of the wealthiest families in Asia. The other wealthy families are not pleased to see one of their most eligible bachelors cozied up with an “ABC” (American-Born Chinese). Cat-fighting, family feuds, a particularly nasty prank involving a dead fish, and general drama ensue in the weeks leading up to the biggest wedding of the year. The characters are charming and the cast is big and well-rounded. Nick’s cousin Astrid suspects her husband of cheating, and that plot provides an interesting counterpoint to Rachel and Nick’s relationship. The villains can be a bit flat, but if you accept the purported cultural norms under which they operate their actions don’t seem as far-fetched. Unlike many books juggling several plot lines and points-of-view, I enjoyed each one and was never bummed when they switched. The flashbacks were employed deftly to provide background and context for the present-day drama. The ending is the only part keeping me from recommending the book whole-heartedly. The book makes an abrupt shift from a light-hearted romp to something deeper around the last quarter. It gets wrapped up in the heavy themes of finding your personal identify vs. what your family expects of you, and determining when your family history matters and when you should cast it off. While somewhat unexpected, this shift and the ending generally transform the book from a light one-time beach read to something that I’d be interested in discussing with friends or a book club. A quick note on the audio: the narrator uses a variety of accents for the characters. The variety did not help me keep any of them straight, but several of them were a bit grating at first. It wasn’t enough for me to abandon the audio, and after the first two or three parts I stopped noticing it, but if accents are a pet-peeve of yours, check this one out in print. Verdict: Affirmed. If you enjoy reading tabloids and are fascinated with the lives of the super-rich, no matter from where they hail, check this one out. Fans of “Bergdorf Blondes” will enjoy this genre taken to a new continent. 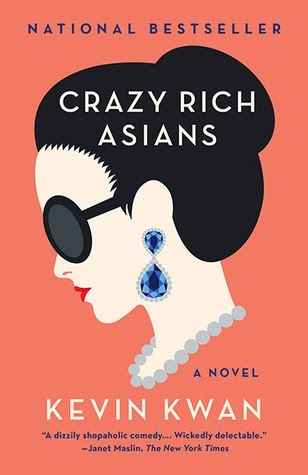 “Crazy Rich Asians” by Kevin Kwan, published by Doubleday on June 11, 2013. Paperback reprinted by Anchor on May 20, 2014. Audio narrated by Lynn Chen, published by Random House Audio on June 11, 2013.